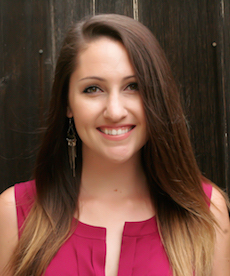 But living in an apartment complex (especially one without a bacony…. *ahem*), can make things tricky. Thank God for grill pans. I got one for Christmas a few years ago, and now I have no idea how I ever lived without it. Yes, it does turn my apartment into a smokehouse while I’m grilling (thanks to the joke of an exhaust fan above our stove), but I’m willing to risk the black lung for the taste of some grilled meats and vegetables. Nothing sticks to it, and the cast iron holds a ton of heat to give you those grill marks and char that are the hallmarks of good bbq. Yes, you won’t get the smoky flavor you might get from charcoal or smoking chips, but it’s a pretty darn good second place. Basil is just as much a summer staple as grilling, so why not pair the two together? Sounds like a genius plan, if I do say so myself. 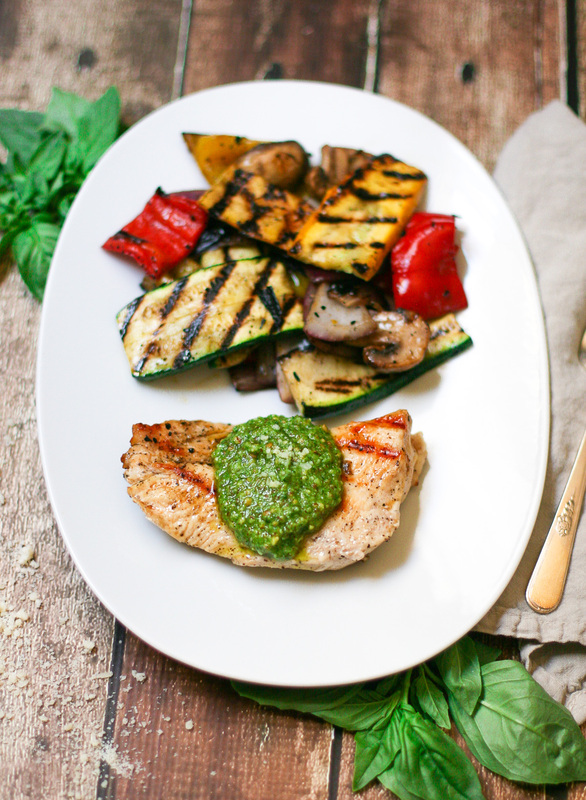 Enter: homemade pesto to spoon all over your grilled meat (and veggies, if you desire). It’s so much more flavorful than any storebought kind, and pretty much makes anything you put it on taste like heaven. That’s why you can get away with just salt and peppering some chicken breasts and grilling ’em. 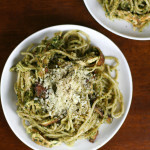 The pesto topping steals the show and makes plain chicken taste divine. I pretty much never make pesto w. pine nuts anymore. They’re way too freaking expensive. I’ve come to really enjoy pesto made with almonds though… If you use roasted salted almonds, it pre-seasons your pesto, and the almonds give the pesto a nice chunky toothsome texture that I really like. Plus, they’re pretty mild, so they support the true stars of the pesto (basil, garlic, and cheese) without stealing the show. Win-win-win. So, what are you waiting for? Get to grilling! 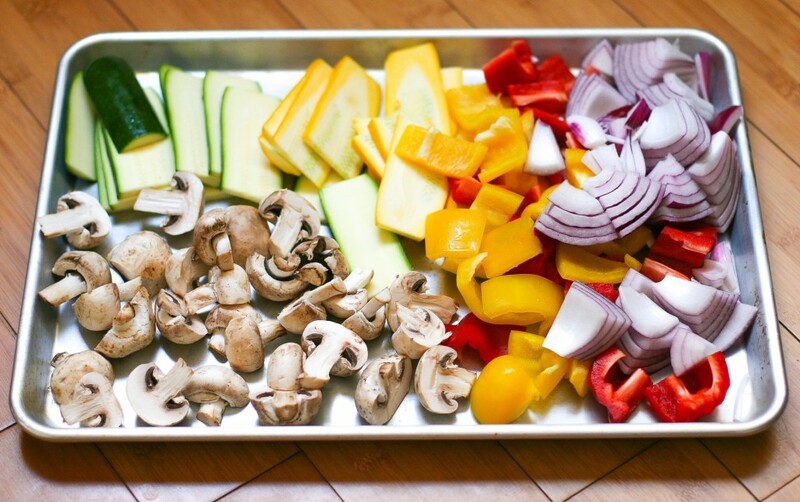 Place all the cut vegetables on a large baking sheet. Drizzle liberally with oil, and sprinkle generously with kosher salt and ground black pepper. Use your hands to toss the veggies on the tray, making sure that each veggie is well coated with oil and seasoning. Light a grill or preheat a grill pan (I used a grill pan). Add enough veggies to fill the grill pan, and grill a few minutes on each side, or until nice and charred. If you are using a real grill, I recommend using a grill basket to keep the vegetables from falling through the grates. When they are done, remove the veggies to another large baking sheet. The vegetables will cook at slightly different speeds, with the mushrooms taking the least amount of time, and the onions taking the longest. Remove the veggies as they finish cooking and add new ones to take their place. Continue until all the veggies are grilled to your liking. Next, add the chicken breasts to the now empty baking sheet that had the uncooked vegetables on it. Repeat the process of drizzling with oil and seasoning with salt and pepper on both sides. Grill the chicken breasts for about 6 minutes on each side, or until the breasts reach an internal temperature of 165 degrees (use a meat thermometer if you're not sure) When the chicken is done cooking, remove from the grill and place on the baking sheet with the grilled veggies. Let the chicken and vegetables rest while you make the pesto. Add the almonds, cheese, garlic, basil, and olive oil to a mini food processor & pulse/blend for a minute or so until the pesto is relatively smooth. 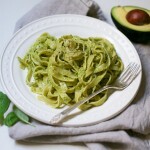 Since this pesto uses almonds instead of pine nuts, it will remain a little chunkier, but it has AWESOME flavor. 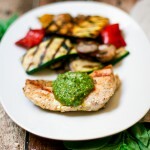 When you're ready to eat, add a chicken breast to each plate with a bunch of grilled veggies. 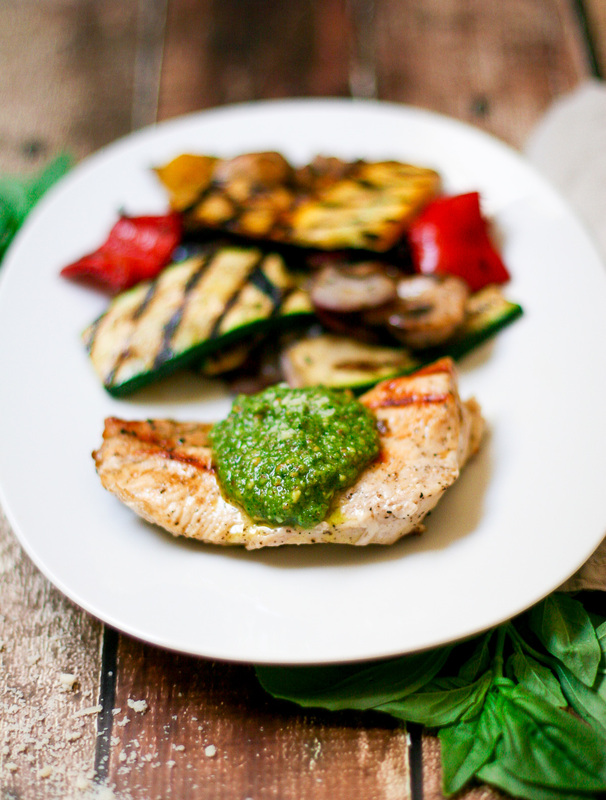 Top the chicken with a generous dollop of pesto, and enjoy! 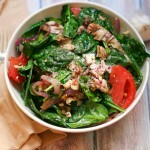 Goes great with some grilled bread or brown rice. *Please note that any amazon links are affiliate links, and I will receive a small commission on any purchase. Thanks for the support!